#M0040. Gray streaked veiled headdress; high necked and long sleeved leotard; distressed bridal gown; decayed bridal bouquet; gloves. Rental Item. $54.50 each. #M0060. Latex skull mask; hooded, long sleeved and floor-length robe. Rental Item. $52.50 each. #M0080. Full formal ensemble: Shirt; vest; black bow tie; black tail coat; dress trousers; white or gray gloves; short black cape. Rental Item $99.50 each. #M0100. Full formal ensemble: White wing collared shirt; black vest; black banded bow tie; black tail coat; dress trousers; cane; gray or white gloves; long black cape with red satin lining; blood red baldric. Rental Item. $120.50 each. #M0160. Latex mask; pullover sweater; large, distressed and coarse jacket enlarged with shoulder pads; distressed trousers; rope belt; oversized latex hands. Rental Item. $84.50 each. #M0162. 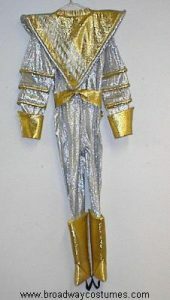 Stretch silver lamé jump suit trimmed with gold lamé; gold lamé torso overlay with built in belt; gold lamé gauntlets; boot tops. Rental Item. $64.50 each. #M0164. Stretch silver lamé and purple satin jump suit trimmed in red lamé; red lamé boot tops. Rental Item. $64.50 each. #M0166. 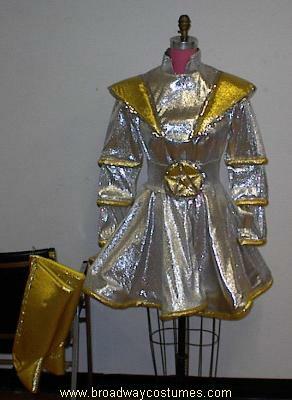 Stretch silver lamé dress trimmed with gold lamé; wide belt with oversized and jeweled buckle; lamé boot tops. Rental Item. $64.50 each. #M0168. Silver lamé jump suit; chest piece; helmet; boot tops; gloves. Rental Item. $84.50 each. #C0175. One-of-a-kind piece. Textured crepe dress with chiffon drapes at sleeves; open chest piece with tubing wrapped around from front to shoulders. Rental Item. $84.50 each. #M0200. Full mask of flax-like wrapping (with 17 teeth still remaining in the jaw); one-piece flax-like body suit; soft wrapped hands. Rental Item. $64.50 each. #M0220. Yellow and black striped Tut-style headdress; one-piece flax-like body suit; soft wrapped hands. Rental Item. $64.50 each. #M0240. Grotesque hands; wing or period collared shirt; tie; vest; caped coat or frock coat and cape; dark or formal trousers; cane. Rental Item. $89.50 each. #M0242. Black high hat; white three-quarter mask; white shirt; white bow tie, cravat or stock; white vest; black tail coat; formal black trousers; white gloves; black cape. Rental Item. $120.50 each. #M0350. 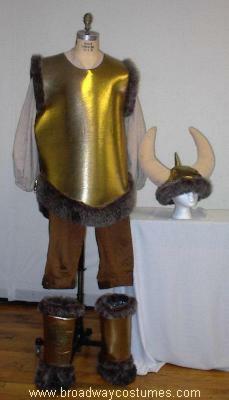 Gold lamé tunic with brown faux fur trim; tunic or peasant shirt and breeches; matching horned helmet; coordinated boot tops. Rental Item. $64.50 each. #M0352. 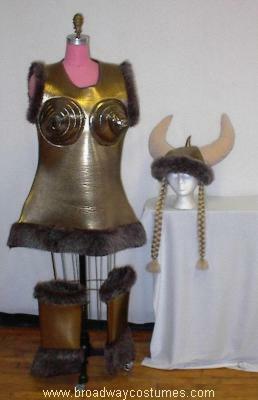 Gold lamé mini dress with cone breasts and brown faux fur trim; matching horned helmet with attached blonde braids; dance trunks; coordinated boot tops. Rental Item. $64.50 each. #M1100. Light blue, red, or gold shirt; black trousers. Rental Item. $54.50 each. #M1120. Light blue, red, or gold mini-dress; dance trunks. Rental Item. $54.50 each. #M1200. Teal and black, maroon and black, or gold and black shirt; black trousers; rank insignia. Rental Item. $54.50 each. #M1220. Teal and black, maroon and black, or gold and black jumpsuit; rank insignia. Rental Item. $54.50 each. #M1300. Teal and black, maroon and black, or gold and black shirt; dickey; black trousers; rank insignia. Rental Item. $54.50 each. #M1320. Teal and black jumpsuit; dickey; rank insignia. Rental Item. $54.50 each. #M1321. Two-toned maroon jumpsuit; belt; rank insignia. Rental Item. $54.50 each. #M0380. Black cone shaped witch’s hat; fitted black bodice or blouse; full-length skirt; black cape; red and white hose or black tights. Rental Item. $74.50 each. #B5515. Broom. Rental Item. $3.50 each. #M0400. Black cone shaped witch’s hat; full black floor-length hooded hag robe. Rental Item. $64.50 each. #M0420. Long and clinging black gown (that zips up the front) with sheer chiffon bishop sleeves, seductive slits on either side and glittering black sequin trim. Rental Item. $74.50 each. #M0430. Large witch’s hat; black dress with puffs and panes over long fitted sleeves; bodice with peplum; floor-length skirt; full black cape; broom; red and white hose. Rental Item. $84.50 each. #F5416. Black lace-up shoes with 2-inch heel. $21.50 per pair. #C0235. Pink organza bodice with silver sequins and silver hand painted accents; full pink organza skirt with hand painted accents; large pink wire frame crown; wand. Rental Item. $84.50 each. #M0440. Gruesome hooded mask and matching hands covered with synthetic brown hair; distressed 1940s two-piece suit; shirt, pullover shirt or sweater; rope cord belt. Rental Item. $84.50 each.